I want to start off by saying don’t panic if you forget something. This time around we made the rookie mistake of forgetting all of Mila’s bottles, milk and food in the tray as we went through security and only realised half way to Dubai. Did we panic a little the moment we realised? Absolutely. But luckily I always pack half in hand luggage and half in a suitcase so we always have two of everything. And I prefer to give Mila fresh food as opposed to ready-made food anyways so even though I take a few sachets of Ella’s Kitchen with me I will always give her a mushed up banana or piece of avocado if thats an option and more than likely it is. Point is your baby wont starve! But its always good to pack an extra set of everything in your suitcase. JUST IN CASE. The easiest solution is of course to breastfeed your child but as I have now stopped I always plan for worst-case scenarios. So what do you need to take with you to make your life easier? I would definitely recommend getting a travel buggy or at least a cover for your pram such as this one for my bugaboo cameleon as the last thing you want is for your pram to get damaged. I have Rimowa suitcases (which btw are amazing and so chic!) and they are made of aluminium and even so they get dents in them from being throw around at airports so you can imagine what could happen to your pram. We bought the BabyZen Yoyo as a travel pram and loved it for the first 6 months. Its so tiny and you can take it straight onto the plane and store it in the overhead locker. Only downside is that as Mila is now so big we had to change from the cot attachment to the seat attachment and its really uncomfortable for her to be in when she is sleeping. We are used to taking her out with us for dinners in the evenings and now in Dubai she woke up quite a lot because she didn’t find it comfortable. (We ended up taking her in a car seat to La Petit Maison one night which btw I loved and putting her on the sofa next to us. She didn’t move once!) Some people like to take their car seat on holiday. We don’t. On most holidays we don’t drive so if we really need one we borrow from the hotel but I know some people prefer to have their own. In that case I can recommend the Maxi Cosi in pebble which we have. Another item that I have just ordered is a travel cot – its shocking how bad the cots can be at some of the nicest 5 star hotels. I ordered the Nuna but the Baby Bjorn seems to get pretty good ratings too. And lastly quite a few of you were asking about my buggy clips – they are £5.99 from John Lewis and they are amazing!! I use them in London all the time to hang Mila’s nappy bag and my shopping bags on. Next up: make sure your baby is comfortable and warm. I do like to splurge a little on clothes for Mila but I try to be practical and spend on items she can use again and again. I am a sucker for cashmere (Harrods own brand is great) but mainly because it is so warm and then you don’t need to dress your baby in so many layers. I also love to dress her in sweatshirts (Kenzo ones are my favourite!) as they are just easy to pair with leggings and perfect for travel. And I cannot stress the importance of blankets. Blankets are amazing as they are so versatile. You can double them up as playmats on holiday as well as using them to cover your baby on a flight or put them underneath your sleeping baby at any time for maximum comfort. ANOTHER thing (as well as my Chanel espadrilles – heartbroken) I lost on this holiday was Mila’s blankey – you know the one she became obsessed with when we went to Mauritius?! I couldn’t believe it. Luckily I took quite a few and she hasn’t been traumatised by the loss as she actually doesn’t care anymore what blanket it is she just loves falling asleep to something soft pushed up against her cheek. My top blankets include this White Company Star Blanket, the My 1st Years one I lost, this one from Baby Mori, and Harrods have a whole selection of amazing ones. Im going to order another one of the My 1st Years one I lost because I love that you can have it monogrammed. (it was also a super lightweight one which is perfect for warmer holidays!) And comfy shoes for your baby. They might not be necessary but if it gets cold its good to have anyways – my go-to brand is Easy Peasy. And finally the more practical items you need to take with you. Something that I always found really practical is this waterproof card thermometer from John Lewis – its £3.95 and still works (I bought it in August!) I am more relaxed about bath temperatures now and can feel it by hand easily but in the beginning I wanted it to be the correct temperature and this was great. Swaddle cloths are always a must – they can be used as bibs as well as to cover up the pram from the sun (I read a lot about this last summer and how babies can overheat but I think as long as you obviously keep an eye on your baby and you leave gaps for fresh air then its totally fine) you can never have enough swaddles. If your baby is on solids then all of this (hideous) plastic is great – from the bowls to the spoons they are light and easy to clean. 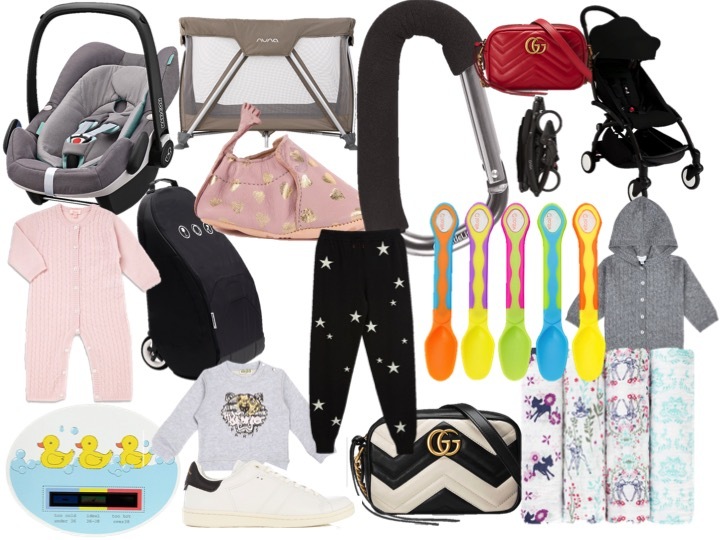 Mila has always used a sleeping bag so its great to take one with you if thats what your baby is used to – basically just keep everything as similar (that includes routine if your baby has one) as possible to what you have at home. Mila had jet lag for the first day and she was soo sleepy (which I actually loved haha because she hasn’t fallen asleep on me like that since she was a newborn!) but by day 2 she was back to her normal routine. And finally, toys and books! Basically as many distractions as possible. You need to be able to entertain your baby so take lots as babies get bored.